Introducing our April 2019 artist, Sara Pearson. Sara is an Akin Dupont member and her multi medium installation, Wayfinder is on exhibition in the Akin Vitrine Galleries for the months of April and May. Using material as a narrative tool, Wayfinder is a layered installation of collage imagery. Shimmering mineral watercolour on terraskin paper (made from stone) the overscaled landscape references a desired destination: as we travel through life and forge our path, we set goals, build foundations and envision our future. The floor of the gallery is covered with handmade unfired clay pebbles- impermanent objects that suggest that sometimes/many times the ground shifts, falls away, and we must again find our footing and start in a new direction. Standing on this landslide is a Wayfinder, a sculptural form of ceramic and aluminum mirror, a navigational tool used as a beacon or a landmark to guide us along our new path. Sara Pearson is a Toronto based artist whose work has centered on the merging of science (geological and gemmological) and a self-reflexive fine arts practice choosing materials and references that relate as elemental to the earth. Through abstracted painting of gemstone refraction and land formation, and sculptural methods of bronze casting, ceramics and assemblage, she has explored concepts such as human value systems, the sublime quality of nature and the journey of transformation. Sara holds a BFA from the Ontario College of Art and Design. She has participated in solo and group exhibitions with Patel Gallery, and has shown work in Ontario and British Columbia. Mineral watercolour on terraskin paper, ceramic, aluminum, and unfired clay. 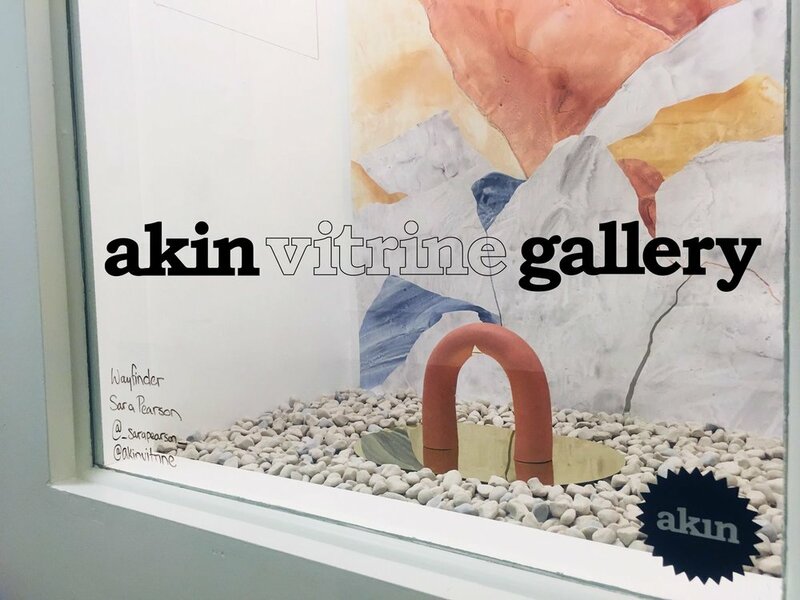 Akin Collective + Akin Projects are excited to present our 2019 programming in two Vitrine Galleries located at Akin Dupont and Akin St. Clair. These miniature galleries feature the diverse talents of our members with travelling installations rotating each month. Each artist will be featured for the first month at Dupont and second month at St. Clair. For more information about our artists and our programming, join us on Instagram @akinvitrine. ‘Wayfinder’ will be on view for the month of April in our Dupont Akin Vitrine Gallery, located in the Clock Factory Building at 1485 Dupont Street (entrance on Campbell Avenue). Find Akin Studio 215 on the second floor and follow the sign into the hallway around the corner. The building is open from 9am to 6pm, Monday to Saturday. The exhibition will then travel to the Akin St. Clair Vitrine Gallery and be on view for the month of May at 1747 St. Clair Avenue West. Gallery is street level and can be viewed at any time. **Sneak peek images of the work located in the event posts!